This document focuses on supporting advocates who are interested in working with state-level policymakers to develop state ESSA plans. It provides practical resources and emphasizes several key areas with the greatest potential impact on student health. The third edition of the document was updated in March 2017. Specific issue-based addenda will be released throughout the year and can be found in the Spotlight Issues tab. … plus Background, Resources, Case Studies and More. This guide highlights how needs assessments can be a valuable tool to identify, understand and address health conditions that affect academic performance. ESSA presents an important opportunity to create public accountability around chronic absenteeism and ensure state ESSA plans support a comprehensive approach to address chronic absenteeism. 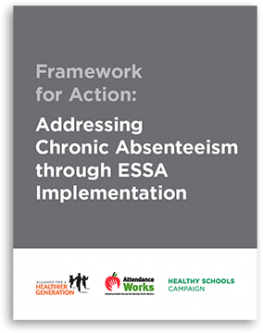 This document highlights various approaches that stakeholders might use to leverage ESSA to support efforts to address chronic absenteeism. 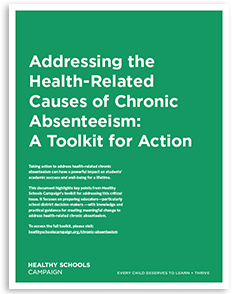 Other resources on Chronic Absenteeism, including Addressing the Health-Related Causes of Chronic Absenteeism: A Toolkit for Action can be found in the resources tab. Ensuring students have access to healthy school meals, nutrition education and physical education is a key strategy for supporting their academic success and health. 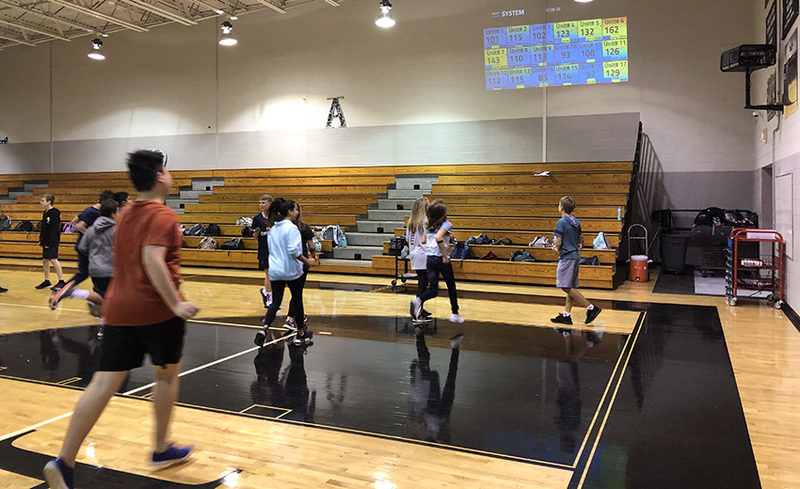 As states develop and implement their state ESSA plans, it is critical that they do so with an understanding of the connection between nutrition and physical activity and academic success. This document highlights ways for states to incorporate measures of nutrition and physical wellness into their report cards, accountability systems, needs assessment processes and professional development. Sign up for our mailing list to find out about upcoming events, webinars and publications related to ESSA implementation. Currently, states around the country are working to develop state plans to implement the Every Student Succeeds Act (ESSA). 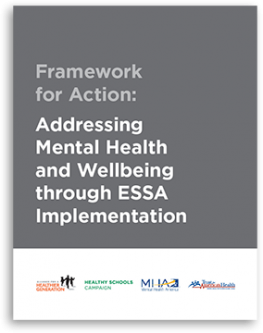 ESSA recognizes the need for schools to support the whole child and specifically acknowledges the importance of student health and school wellness. This webinar is an opportunity to learn about this important resource and connect with other advocates working to advance student health and school wellness through ESSA state plans. You can watch a recording of the webinar below and download a copy of the slides. The Every Student Succeeds Act (ESSA) recognizes the critical impact chronic absenteeism has on student success. Multiple levers exist in the law for supporting efforts to address chronic absenteeism. 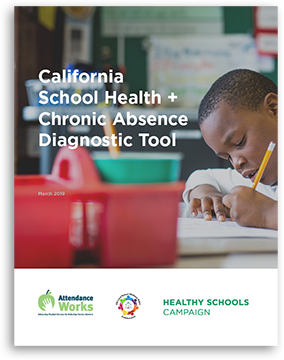 For example, states and school districts are now required to include the rate of chronic absenteeism on their school report cards and professional development funding can be used to train school staff on how to address chronic absenteeism. In addition, many states are using rate of chronic absenteeism as a measure of school quality in the in their state accountability systems. 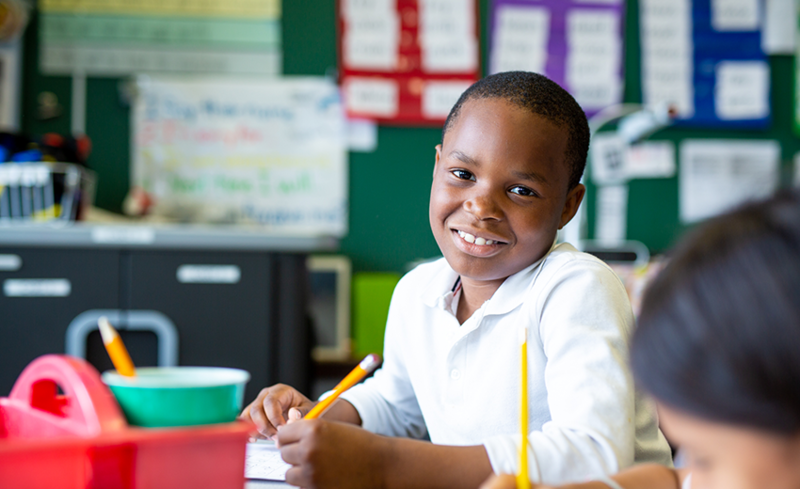 This webinar is an opportunity to find out more about this important issue, and connect with other advocates working to address chronic absenteeism through ESSA state plans. You can watch a recording of the webinar below and download a copy of the slides. Ensuring students have access to healthy school meals, nutrition education and physical education is a key strategy for supporting their academic success and health. 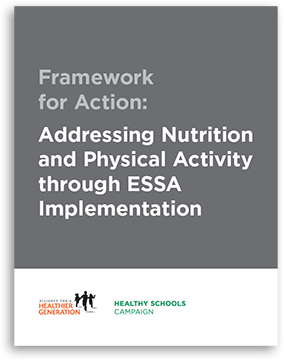 As states develop and implement their state ESSA plans, it is critical that they do so with an understanding of the connection between nutrition and physical activity and academic success. To be alerted when a new topic becomes available, or to sign up for related webinars, sign up for our mailing list. 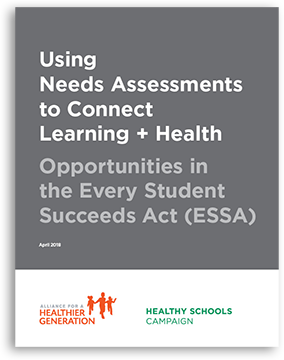 The development of ESSA state plans presents an excellent opportunity to incorporate health and wellness indicators into education planning and practice. Ensuring that our accountability systems, reports cards, needs assessments and professional development programs are fully integrated to support the health and well-being of students is a crucial step towards academic achievement, improved graduation rates, and college and career readiness. But, the state ESSA plan is just one step. Advocates and stakeholders will need to stay engaged with state budgeting processes that will impact the viability of the best-intentioned plans and will need to stay aware of competing demands that may distract from health and wellness goals. Further, the plans will be resubmitted to the U.S. Department of Education every four years. In short, the process in which we are currently engaged is the beginning, not the end. 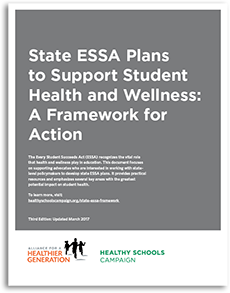 As our nation moves forward with ESSA implementation, we urge you to stay engaged and focused on the shared goal of ensuring all our schools truly support student health, wellness and learning. We invite you to share your experiences developing ESSA state plans, including the challenges, successes, questions or observations you encounter. If you would like to receive updates and additional resources, or if you would like to share your experiences to help inform the national dialogue about this issue, please contact Alex Mays.